Autumn conjures up the sound of crunching leaves, the sight of huddled orange pumpkins, and the feeling of a cup of apple cider warming your hands. It also means the start of fall festivals and fairs to celebrate the season! Many GFWC clubwomen mark the beginning of the club year and the advent of fundraising by hosting their own fall festivals. GFWC Lamoille Women’s Club (Nevada) sponsors an annual two day Fall Craft Festival in November. 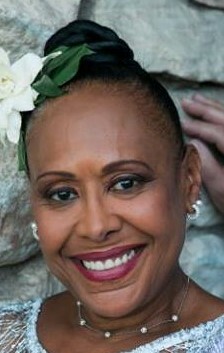 The fundraiser goes toward providing scholarships and other community projects. Vendors come from across the neighboring states— California, Idaho, Utah, and Arizona— and some dedicated vendors have been participating for all seven years since the festival’s inception. The club is in a particularly rural area, and so the craft show is a great occasion to bring together the whole community. Bakers and businesses participate in the Gingerbread House Showcase. The Boy Scouts and other non-profit groups volunteer at the event, and in turn, they are provided with a free booth that allows them to fundraise for their own cause. The GFWC Lamoille Women’s Club sets up a Membership table and a booth with hand sewn items, and unveil their annual Country Fair quilt. The GFWC St. Petersburg Junior Woman’s Club (Florida) hosts a Pumpkin Palooza Family Fall Festival, which boasts of a petting zoo, games and prizes, a pumpkin patch, face and hair painting, craft vendors, and food trucks. Additionally, Pumpkin Palooza serves as a canned food drive for World Food Day. The club enjoys this project because it gives them a chance to connect with the community and raise money to give back to local non-profits. Some clubs have an incredibly long tradition of hosting a fall festival! Take Exeter Area GFWC (New Hampshire) for example: the club will be hosting its 41st Annual Yuletide Fair. At the fair, 120 crafters sell a variety of handmade items from baked goods to jewelry. 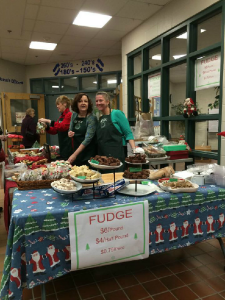 In addition to serving coffee and snacks throughout the day, clubwomen sell homemade fudge and cookies to raise money for Dollars for Delegates, which sends members to state, district, region, and international meetings. The local Juniorette club, Girls in Action, are given free space to sell holiday decorated paper bags that patrons can use to hold their purchases. There’s a suggested entrance donation of a dollar to support local food pantries, and that alone usually brings in about $1500. The fundraising tradition nets approximately $15,000 that Exeter Area GFWC uses to support local families and charities, as well as GFWC partners. 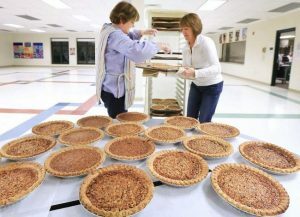 In another example of a long tradition, the GFWC Greenland Woman’s Club (New Hampshire) will be hosting their 27th annual Craft Fair and Pie Festival that raises money for their community projects. The first year of the fair, the club had 90 pies to sell, and they worried they couldn’t accomplish that. Now they sell over 500 pies each year, and have been coined the “Pie Ladies”. Hosting a fall festival is an exciting project that not only gets GFWC clubwomen ready for the new club year, but also serves as a way to forge a lasting relationship with their communities, who quickly learn that GFWC clubwomen know how to fundraise in style!